In the run-up to her appearance at a recent event celebrating Stevie Smith's poetry, held in London, Zoë spoke to writer Bidisha about Smith's appeal for an article published by BBC Arts. 'She offers us a body of work that veers with unnerving regularity from baffling to acutely profound,' Zoë remarks in the article. The other contributors to the BBC Arts article – academic Will May, biographer Frances Spalding and journalist Rachel Cooke – are also Smith enthusiasts. (In fact, May, who's edited The Collected Poems and Drawings of Stevie Smith, appeared alongside Zoë at the Cheltenham Literature Festival.) 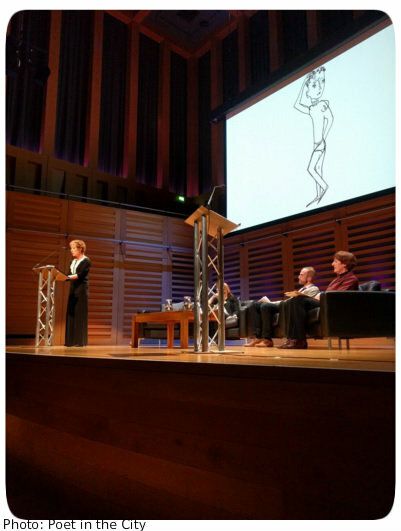 They joined Zoë on stage at the London event, which was hosted by King's Place on 15 February. Presented by arts organisation Poet in the City and publisher Faber & Faber, the event attracted an audience of several hundred literature fans. Poet in the City's chief executive, Isobel Colchester, announced that it would celebrate 'Stevie Smith in all her diversity'. Frances Spalding, the author of what's regarded as the definitive biography of Stevie Smith, emphasised that the writer made little direct comment on her own life. Even so, it's clear that the bleakness of some of Smith's poems contrasts with the 'rooted existence' (in Spalding's words) the writer enjoyed at home in Palmers Green. She feels that Smith had a gift for writing 'succinct, tragicomical and universal' poetry. Spalding's talk was followed by some of Smith's bleakest poems. Zoë performed the wry yet moving 'Poor Soul, Poor Girl!' (in which a morbid debutante 'cannot imagine anything nicer / Than to be struck by lightning and killed'), 'Do Take Muriel Out', 'I'll Have Your Heart', 'Infelice', 'Pad, Pad' and 'Thoughts about the Person from Porlock'. The evening's poems were accompanied by Smith's spidery line drawings. As Will May pointed out, the links between the drawings and poems are rarely obvious. The drawings never depict what we expect to see; instead they highlight Smith's fondness for interruptions, especially 'distractions and evasions', May emphasised. Smith's writing is at its most mysterious and mesmerising in 'La Singe Qui Swing' (a poem, sung to the tune of 'Greensleeves', in which an ape frolics on a garden swing) and 'The River God' (the god boasts about bringing a woman down to his 'bed'). Both works were read beautifully by Zoë, as was 'Souvenir de Monsieur Poop', which pokes fun at the literary establishment that so often shut out Smith. As Rachel Cooke remarked in her talk, Smith is 'always in the process of being rediscovered' and deserves a prominent, permanent position in the literary canon. Cooke said that she's admired the writer since childhood and finds Smith's 'wit, her irony' and 'taste for silliness and play' often appeals to young readers. Smith had 'pluck', determination and a talent for 'bend[ing] the ordinary world out of shape'. Zoë read two poems that highlight Smith's playful side and taste for darkly comic scenarios: 'The Jungle Husband' ('Yesterday I hittapotamus / I put the measurements down for you but they got lost in the fuss'!) and 'I Remember'. She then explained that she'd been unfamiliar with Smith's poems when she first encountered Stevie, an 'extraordinary play', but quickly grew to love them. The poems' 'black humour' appeals to Zoë, and reading them brings her 'joy'. Zoë highlighted Smith's power as a poet when she read the troubling, thought-provoking 'God the Eater'. Afterwards, she lightened the mood by performing a couple of Smith's wittiest, funniest works, 'The Galloping Cat' and 'Tenuous and Precarious'. Those two highly entertaining readings rounded-off the Stevie Smith celebration and ensured that the audience shared in the joy Zoë finds in the writer's wide-ranging work.